Baffins Milton Rovers progressed in the FA Vase with an impressive 3-1 win at Bradford Town. Both teams took time to settle on a pudding of a pitch. But it was Baffins who registered the first meaningful effort on goal. Ashton Leigh rose to met a corner from his brother Tommy, but he saw his headed effort go wide of the target. That gave Baffins hope, though, and soon afterwards Fidel Seibou raced down the line. He managed to get a cross into the Bradford box and pick out team-mate Callum Dart, but his shot was blocked before the home side scrambled the ball clear. As the first half progressed, the hosts rarely threatened. However, they were almost gifted a goal when a cross spun up off Ashton Leigh and presented them with a goalscoring opportunity. Baffins keeper Cameron Scott was relieved, though, when the Bradford player missed the target. The visitors took the lead in the 55th minute when Jason Parish broke the offside trap and raced down the line. He cut the ball back to Dart, who misplaced the keeper before firing home. Immediately afterwards, Dan Cottle’s cross was met by Matt Morris, but his effort from outside the post rattled against the post. Yet Dart made it 2-0 when he finished off a fine flowing move involving Tommy Leigh and Seibou. 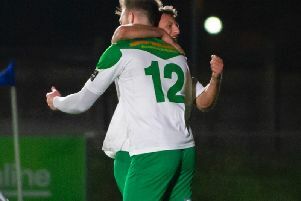 Tommy Leigh made sure Baffins were in the next round on 87 minutes, when he applied the finish to Tommy Tierney’s cross. James Rustell scored a late consolation for the home side on the stroke of full-time.